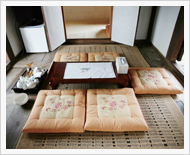 Traditional Korean rooms have multiple functions. Rooms are not labeled or reserved for a specific purpose; there is no definite bedroom or dining room for example. Rather, tables and mats are brought in as needed. Most people sit and sleep on the floor on thick mats. Underneath the floors are stone or concrete flues. Traditionally hot air was vented through the flues to provide heat. Clay or cement would be placed over the stones to protect the residents from noxious gasses. This type of under floor heating is called ondol. Nowadays hot water is piped through cement floors covered with linoleum. The hanbok has been the Korean people's unique traditional costume for thousands of years. The beauty and grace of Korean culture can be seen in photographs of women dressed in the hanbok. Before the arrival of Western-style clothing one hundred years ago, the hanbok was worn as everyday attire. Men wore jeogori (Korean jackets) with baji (trousers) while women wore jeogori with chima (skirt). Today, the hanbok is worn on days of celebration such as weddings, Seollal (Lunar New Year's Day) or Chuseok (Korean Thanksgiving Day). 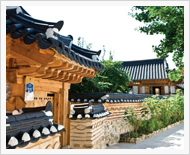 A traditional Korean house is called hanok. Hanok sought to create a living space based on the coexistence of nature and humans. Accordingly, the natural aspects of traditional Korean houses range from the structure's inner layout to the building materials which were used. Another unique feature of traditional houses is their special design for cooling the interior in the summer and heating the interior in the winter. 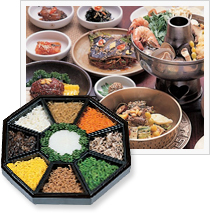 Since Korea has such hot summers and cold winters, the ondol gudeul, a floor-based heating system and daecheong, a cool wooden-floor style hall, were devised long ago to help Koreans survive the frigid winters and to make the sweltering and humid summers bearable. These primitive types of heating and air-conditioning were so effective that they are still in use in many homes today.